REALITY Illinois is an anti-tobacco campaign developed by Illinois' teens and funded by the Illinois Department of Public Health (IDPH) as part of the Illinois Tobacco-Free Communities Program. 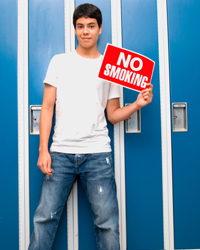 The Program works to educate teens on the health effects of tobacco use and secondhand smoke and on how tobacco companies target teens through deceptive advertising and marketing practices. Additionally, REALITY Illinois seeks to directly impact tobacco control policies by working locally on issues such as reducing exposure to secondhand smoke. A Teen Youth Group, made up of local youth from the the Kendall County Student Leadership Initiative Program (SLIP) and the Plano commuity, are the driving force behind REALITY Illinois. The teens meet regularly to learn more about the tobacco industry's deceptive advertising tactics, how the industry targets teens and what they can do to fight back. They also brainstorm ideas on how to spread the word in the community about the harmful effects of tobacco. Gain important research, analytical, critical thinking, communication, and teamwork skills. Develop and conduct surveys to gauge attitudes of community members on tobacco and smoke-free related topics. Create presentations to encourage smoke-free public places and raise awareness of dangers related to tobacco and second hand smoke.